This description, however, leaves out a series of interesting and suggestive bits of information. It is simplictic, for example, to view Origen and the Antiochenes as representing two opposite approaches more or less exclusive of each other. As we shall see, Origen used and defended literal interpretation on a number of occasions. Moreover, certain exegetical features that we would quickly dismiss as in some sense “allegorical” were consciously adopted as legitimate by the Antiochene exegetes. A word now upon transferred application, by which we mean giving a literal turn to language which is figurative, or vice versa. Thus, whenever the writer steps on to icy roads, he hesitates not to literalize the prayer, “Hold Thou me up, and I shall be safe” (Psalm 119:117). “I will both lay me down in peace, and sleep: for Thou, Lord, only makest me dwell in safety” (Psalm 4:8) is to be given its widest latitude, and regarded at both the rest of the body under the protection of Providence and the repose of the soul in the assurance of God’s protecting grace. In 2 Corinthians 8:14 Paul urges that there should be an equality of giving, or a fair distribution of the burden, in the collection being made to relieve the afflicted saints in Jerusalem. That appeal was backed up with, “As it is written, he that hath gathered much had nothing over; and he that had gathered little had no lack.” That is a reference to the manna gathered by the Israelites (Exodus 16:18): those who gathered the largest quantity had more to give unto the aged and feeble; so rich Christians should use their surplus to provide for the poor of the flock. But great care needs to be taken lest we clash with the Analogy of the Faith: thus “the house of Saul waxed weaker and weaker” (2 Samuel 3:1) certainly does not mean that “the flesh” becomes enervated as the believer grows in grace, for universal Christian experience testifies that indwelling sin rages as vigorously at the end as at the beginning. or The Sayings of Jesus Exegetically Expounded and Classified. by Rev. George Smeaton, D.D. The present volume is intended to be the first portion of a larger whole, which if completed, will exhibit the entire New Testament teaching on the subject of the atonement. I purposed to survey the whole testimony of our Lord and of His apostles; beginning with the former as fundamental. But as the subject grew in my hands, it was found necessary to reserve, in the meantime, the consideration of the apostolic testimony. 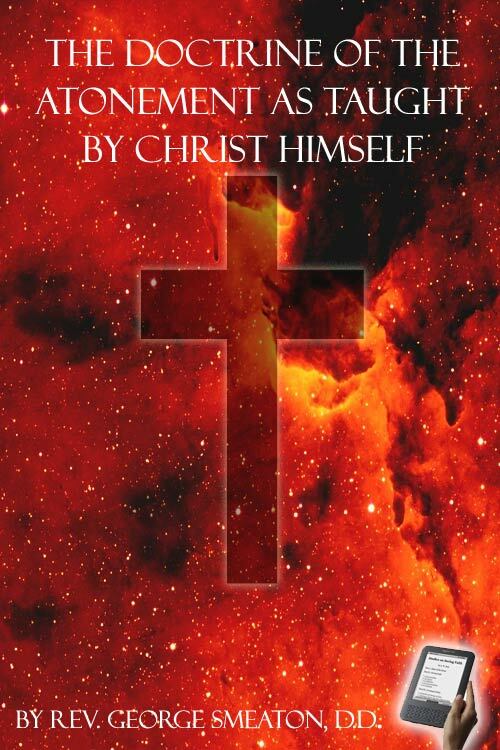 In these pages I have examined, according to the rules of exact interpretation, what Jesus taught on the subject of the atonement, and have given a classification of His sayings and an outline of the doctrine. This seems to be urgently demanded in our times. The necessity of correctly ascertaining, by the only means within our reach, what the Lord actually taught on this point, cannot be overstated, when we direct any measure of attention to modern thought, and to the conflicting views, often as ill-digested by their propounders as perplexing to the minds of others, which are at present given forth on the nature, design, and effect of the Lord’s death. The one-sided views on this great theme, held not by scoffers at vital religion, but by earnest men, actually though not willingly deviating from biblical truth, are not to be corrected by any human authority, nor even by an appeal to the Church’s past, which yet, as the voice of our mother, is entitled to some amount of deference. They can be effectually confronted and silenced only by the explicit testimony of the Church’s Lord. The doctrine will stand there, but will stand nowhere else. And every true disciple has this distinctive feature about him, that he hears the voice of Christ, but a stranger’s voice will he not follow. My task in this work has been simply to determine, by strict exegetical investigation, the import of Christ’s words, and to reproduce His thoughts by the exact interpretation of language. I have no other desire than to ascertain what He did say, and to abide by it. The principle on which alone it is safe to carry on investigations into doctrine on any point, is, I am fully persuaded, to go to the Scriptures, not for the starting-point of thought alone, but for the substance of thought as well, or for the rounded and concrete development of the doctrine in all its elements: and these will be found in Christ’s sayings, if we but patiently investigate them. It is not, then, to the Christian consciousness that I appeal with some modern teachers, nor to Christian feeling and Christian reason with others, but to the consciousness and sayings of the Great Teacher, and of His commissioned servants, employed as His organs of revelation to the Church of all time. In prior posts, I’ve talked about why parents have to care about apologetics (the reasoned defense of Christianity) and I’ve shared resources for getting started with apologetics. I realize, however, that it can seem pretty ambiguous to have a goal of “learning apologetics.” We need to know the specific questions we most need to study and discuss with our kids; the ones that non-believers most frequently challenge Christians on and the ones that most frequently turn young adults away from faith after spending 18 years in church. That’s the purpose of this post. I want to give you a very specific list of 65 apologetics questions every Christian parent needs to learn to answer and discuss with their kids (in age appropriate ways). Of course, any such list is subjective. I created this list based on my own study and experience with engaging in these topics, with a special emphasis on the issues challenging young adults today. You may not think I’ve narrowed it down much by giving you 65, but there are hundreds of questions that could have been listed! In case this looks overwhelming, I’ve highlighted in red my “top 20.” Start with those if you’re new to these topics. I encourage you to take some time and challenge yourself here. Read each question and give yourself a “point” for each one you feel you could thoroughly answer. What would your score be if you had to answer these questions today? In reference to the Calvinistic doctrines—the doctrines of free and sovereign grace held by the Reformers in England, Toplady observes, “Queen Mary and her Spanish husband well knew that Calvinism is the very life and soul of the Reformation; and that Popery would never flourish till the Calvinistic doctrines were eradicated.” Her efforts to destroy by sword and fire those who upheld the Truth earned for her the unenviable appellation of ‘Bloody Mary.’ The charge on which many of them were burnt at the stake was that they held to the doctrine of predestination and rejected the Arminian and Popish doctrine of free-will. (1) God’s decree would be precarious, frustrable and uncertain, and, by consequence, no decree at all. (2) His foreknowledge would be wavering, indeterminate, and liable to disappointment, whereas it always has its accomplishment, and necessarily infers the certain futurity of the thing or things foreknown:”I am God, and there is none like Me, declaring the end from the beginning, and, from ancient times, the things that are not yet done; saying, My counsel shall stand and I will do all My pleasure” (Isa 46:9,10). (3) Neither would His Word be true, which declares that, with regard to the elect, “the gifts and calling of God are without repentance” (Rom 11:29); that “whom He predestinated, them He also glorified” (Rom 8:30); that whom He loveth, He loveth to the end (John 13:1), with numberless passages to the same purpose. Nor would His word be true with regard to the non-elect if it was possible for them to be saved, for it is there declared that they are fitted for destruction, etc. (Rom 9:22); foreordained unto condemnation (Jude 1:4), and delivered over to a reprobate mind in order to their damnation (Rom 1:28; 2Th 2:12). (4) If, between the elect and reprobate, there was not a great gulf fixed, so that neither can be otherwise than they are, then the will of God (which is the alone cause why some are chosen and others are not) would be rendered inefficacious and of no effect. (5) Nor could the justice of God stand if He was to condemn the elect, for whose sins He hath received ample satisfaction at the hand of Christ, or if He was to save the reprobate, who are not interested in Christ as the elect are. (6) The power of God (whereby the elect are preserved from falling into a state of condemnation, and the wicked held down and shut up in a state of death) would be eluded, not to say utterly abolished. (7) Nor would God be unchangeable if they, who were once the people of His love, could commence the objects of His hatred, or if the vessels of His wrath could he saved with the vessels of grace. Hence that of St. Augustine. * “Brethen,” says he, “let us not imagine that God puts down any man in His book and then erases him, for if Pilate could say, ‘What I have written, I have written,’ how can it be thought that the great God would write a person’s name in the book of life and then blot it out again?” And may we not, with equal reason, ask, on the other hand, “How can it be thought that any of the reprobate should be written in that book of life, which contains the names of the elect only, or that any should be inscribed there who were not written among the living from eternity?” I shall conclude this chapter with that observation of Luther.+ “This,” says he, “is the very thing that razes the doctrine of free-will from its foundations, to wit, that God’s eternal love of some men and hatred of others is immutable and cannot be reversed.” Both one and the other will have its full accomplishment. * Tom. 8, in Psalms 68, col. 738. + De Serv. Arbitr. cap. 168. HAVING thus showed you that there is such a thing as a reprobation, I come now to show what it is, which, that I may do to your edification, I shall first show you what this word reprobation signifieth in the general, as it concerneth persons temporary and visibly reprobate. Secondly, more particular, as it concerneth persons that are eternally and invisibly reprobate. First generally, as it concerneth persons temporary and visibly reprobate: thus, to be reprobate is to be disapproved, void of judgment, and rejected, etc. To be disapproved, that is, when the word condemns them, either as touching the faith or the holiness of the Gospel; the which they must needs be that are void of spiritual and heavenly judgment in the mysteries of the kingdom, a manifest token they are rejected. And hence it is that they are said to be reprobate or void of judgment concerning the faith; reprobate or void of judgment touching every good work; having a reprobate mind to do those things that are not convenient either as to faith or manners. And hence it is again that they are also said to be rejected of God, cast away and the like. I call this temporary, visible reprobation, because these appear and are detected by the word as such that are found under the above-named errors, and so adjudged without the grace of God. Yet it is possible for some of these, (however for the present disapproved,) through the blessed acts and dispensations of grace not only to become visible saints, but also saved for ever. Who doubts but that he who now by examining himself concerning faith doth find himself, though under profession, graceless, may, after that, he seeing his woeful state, not only cry to God for mercy, but find grace, and obtain mercy to help in time of need? Though it is true that for the most part the contrary is fulfilled on them. First. The act of God’s election. Secondly. The negative of that act. Fourthly. Their qualification when thus reached by it. For the first. This act of God in electing, it is a choosing or foreappointing of some. infallibly unto eternal life, which he also hath determined shall he brought to pass by the means that should be made manifest and efficacious to that very end. Thirdly. The persons then that are contained under the negative of this act, they are those (and those only)that pass through this wicked world without the saving grace of God’s elect; those, I say, that miss the most holy faith which they in time are blest withal who are foreappointed unto glory. And now for the qualification they were considered under when this act of reprobation laid hold upon them — to wit, they were considered upright. First, from this consideration: that reprobation is God’s act, even the negative of his choosing or electing, and none of the acts of God make any man a sinner. 2. The next thing considerable in the potter, it is the (so) making of the pot, even as he determined, a vessel to honor or a vessel to dishonor. There is no confusion or disappointment under the hand of this eternal God; his work is perfect and every way doth answer to what he hath determined. 1. That the simple act of reprobation, it is a leaving or passing by, not a cursing of the creature. 2. Neither doth this act alienate the heart of God from the reprobate, nor tie him up from loving, favoring, or blessing of him; no, not from blessing of him with the gift of Christ, of faith, of hope, and many other benefits. It only denieth them that benefit that will infallibly bring them to eternal life, and that in despite of all opposition; it only denieth so to bless them as the elect themselves are blessed. Abraham loved all the children he had by all his wives, and gave them portions also; but his choice blessing, as the fruit of his chiefest love, he reserved for chosen Isaac. Lastly. The act of reprobation doth harm to no man, neither means him any; nay, it rather decrees him upright, lets him be made upright, and so be turned into the world. John Bunyan-Reprobation Asserted; Or, The Doctrine Of Eternal Election And Reprobation Promiscuously Handled: In Eleven Chapters Wherein The Most Material Objections Made By The Opposers Of This Doctrine Are Fully Answered, Several Doubts Removed, And Sundry Cases Removed Conscience Resolved.